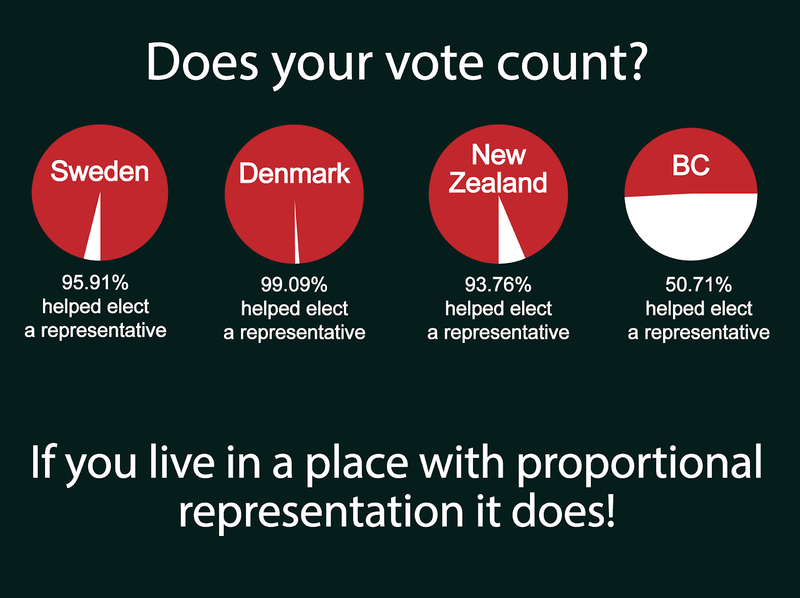 I am rooting like mad for British Columbians to vote in favour of switching our voting system to proportional representation when the referendum gets underway Oct. 22. But I'm nothing if not a realist, and thus quite worried that people's resistance to change - especially when it requires taking time to understand something that appears dull and technical on the surface - will doom yet another rare opportunity to reform the tired and deeply flawed way that we choose our governments. Still, a person has to try. I want to share with you here why I will be voting YES, in bolded capital letters and large font. If you're on the fence, I hope you'll have a read and see what resonates. If you support PR already, I hope this piece makes it easier for you to find the information you need to inform others. All of the information you need to understand PR is available on sites like Fair Vote Canada, Elections BC and Vote PR BC, which is where I've gone for much of what I'm including here. The vote is by mail; you'll get a ballot in the mail soon (send it back completed to Elections BC by Nov. 30) with four check boxes: First, one to ascertain your vote for PR or to stick with what we have now, and then an optional choice to recommend one of three kinds of PR: Dual Member, Mixed Member, or Rural Urban. You can vote in favour of PR without choosing one of those options. Whatever form of PR you choose, they all deliver a government whose makeup actually reflects how people voted. If 30 per cent vote for a particular party, that party ends up with 30 per cent of the seats. We would no longer see governments winning 40 per cent or less of seats, yet ending up with 100 per cent of the power - a common issue with the current First Past the Post system. FPTP is a "winner take all" system that gives total power to the party that wins the highest percentage of votes, even if that percentage is well below majority. PR frequently requires that parties collaborate, concede and negotiate to achieve political goals. Elections that use a PR voting system create a legislature that people genuinely voted for. If a party doesn't win a majority on its own, it will need to build alliances across ideology. Collaboration and concession are essential in everything we do outside of politics, so why the heck would we want anything different for our political process? Try to imagine your family or workplace functioning under a "winner take all" model, and you can see the problem here. PR lets voters choose political representatives who share their values. Unlike our winner-take-all system, which virtually always limits us to endless swings between two dominant ideologies, PR permits voters whose beliefs do not cleave to a particular political dogma to elect people who they think will represent them well. Those people have an opportunity to build coalitions with other like-minded souls to achieve goals outside the interests of the dominant political parties. 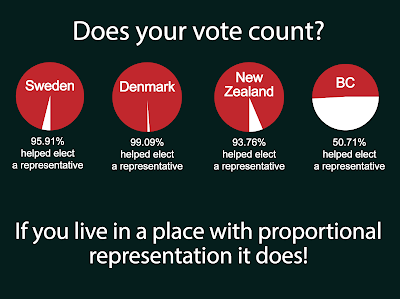 Around the world, PR is the most common electoral system. Of the 195 countries on this map, only 64 use the "winner take all" system that we currently have. Many stable, well-managed countries have PR systems. BC's referendum is putting forward three "made in BC" options. All will maintain strong local and regional representation, and ensure our MLAs are elected by voters, not parties. Between 40 and 50 per cent of eligible BC voters don't bother to vote. Doesn't that strike you as a pretty big concern? Might that not be related to people knowing that their vote doesn't actually count for anything because the causes and candidates they care about are not issues for the dominant parties? Wouldn't it be nice to vote your conscious, without fear that your vote is either meaningless or could let a party you despise win through a split vote? British Columbians have already done the work and recommended PR. In 2004, an independent, non-partisan group of 161 randomly selected British Columbians, the Citizens Assembly on Electoral Reform, spent 10 months considering electoral reform. They conducted 50 public hearings and reviewed 1,603 submissions from fellow British Columbians. They emerged with a consensus to support a form of PR that will be on this fall's ballot, Single Transferable Vote. When a large group of random people with no axe to grind puts in a ton of effort to get completely informed on a subject and then puts forward their recommendation, I listen. If we vote for PR here in BC and end up hating it, we can change back to FPTP after two elections. Important to note here that no country in the world has ever reverted to winner-take-all after introducing PR. But if we want to, that option is built right into the referendum. BC has seen two referendums already on PR, one in 2005 following on the work of the Citizens Assembly and another in 2009. The first vote was actually a win, with 57.7 per cent of British Columbians voting for PR. But then-premier Gordon Campbell - who was against PR but had promised a referendum if elected - had built in a poison pill requiring a "super majority": approval by 60 per cent of voters overall as well as majorities of 60 per cent in each of 79 electoral districts. All but two districts did hit that mark, but the overall vote fell short at 57.7 per cent. Support for PR fell in the 2009 vote, to 40 per cent. But there are a couple of important points that bear noting: First, that the Liberals redrew riding boundaries that would take effect in the event of a "yes" vote in ways that left many voters concerned and uncertain; and second, that the voter turnout overall for the provincial election that included the referendum question was a mere 50 per cent. What are the arguments against PR? Italy is often cited as a cautionary tale of what happens under a PR system, as the country has gone through periods in the past where voters ended up going to the polls every two years because of troubles with rickety coalitions. But even Italy mostly ends up with governments that last as long as any of ours do. New Zealand, another PR country, sets its election term at three years in its constitution, and has adhered to that for at least the past 68 years. As well, PR has allowed New Zealand to ensure minority Maori representation. Opponents also raise the spectre of parties with extreme views taking over. This viewpoint largely feels like fear-mongering to me, not only because this already happens in our existing election system when extreme factions take over a dominant party (federally, Reform to Alliance to Conservative offers a recent example), but because it's a declaration that if people don't think like "us" - that being, people who support one of two dominant ideologies - they don't deserve political representation. To me, concern about extremism makes me even more supportive of PR, where at least everything is out in the open. Think about it: If a majority percentage of voters in your country/province would choose extreme parties, which then might join forces to form government, then you've got so much more to worry about than just which voting system you're using. At least PR lets you see dangerous shifts in thinking straight up, rather than having them sneak up on you through a once-moderate party that ends up subverted by ugly thinking. Extremists can infiltrate any party, and corrupt any political system. We are living in the age of Donald Trump and Doug Ford, living proof. But people, a winner-take-all system is never going to be the cure for that. There was a time when I couldn't have imagined a political time like we're living in, but here we are, living it, suffering through it, getting up every day only to be astounded one more time at what the headlines bring, and how quickly a country can drift into Lord of the Flies territory. We are seeing the rule of men whose sole skill is to get elected. They not only don't know how to govern, they've got no intention of even trying. Their "moral compasses" are no more than animal instincts to win. They're the political arm of the wealthy, who control our governments and elections now more than ever. Yet the ugly stuff that comes out of their mouths is carefully designed to appeal to people who feel powerless and angry - people vulnerable to being persuaded to use their votes like Molotov cocktails to destroy the amorphous "establishment" that they blame for their failed lives. As we now know, the results are horrifying. And it was First Past the Post that got us here. Say no more. Vote yes to PR. Thanks, Jody, for a well written and well thought out post. I hope the residents of BC take the time to understand how much better this is that the old adversarial way we have been doing politics. There are forces working against progress and inclusion. Forces which thrive on divisions and mistrust of the "other". This would be a great step forward to cooperation and inclusion. I too hope people see the sense in PR. Thank you Jody.